Better than pixie dust and happy thoughts! 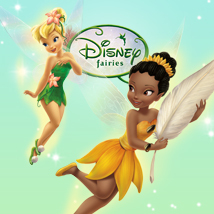 Invite the magic of the Disney Fairies into any room with our beautiful assortment of glittery wall stickers. You'll love adding Tinkerbell, Fawn, Iridessa, Rosetta, and Silvermist to your little girl's walls – and so will she! Fully removable and repositionable, these Disney Fairies wall stickers are quick way to transform a little girl's bedroom, brought to you by Fun House and Jomoval Ltd.